Health authorities say persons who have contracted the mosquito borne disease, Chikungunya, should remain home as Dominica recorded more than 31 cases of the disease so far. Chikungunya is a viral disease that is spread by the aedes aegypti mosquito and the island recorded its first case on January 16 this year. “The numbers keep changing on a daily basis … we have a number of suspected cases and we have a number of confirmed cases. The last count that we have in terms of confirmed cases was 31 cases and we have other persons who have not been confirmed. “We’re asking the persons with the disease to remain at home and to use mosquito nets when they are sleeping and other persons to use mosquito repellents as well,” said Chief Medical Officer Dr David Johnson, adding that it was advisable that people take precautionary measures to reduce the risk of spreading the disease. “We’re asking persons to avoid the spreading of the disease or if they are infected with Chikungunya to ensure that they sleep under a mosquito net that is treated with insecticide,” he said, adding that the Ministry of Health would be sourcing treated mosquito nets for distribution. Health authorities have said the disease have spread to several areas across the island and Dr. Johnson said most of the cases could “be managed at home without having to admit them to the hospital”. He said there was no cause for alarm for the disease whose symptoms include fever, headache, fatigue, nausea, vomiting, muscle pain, rash, and joint pain. Chikungunya: the virus that "bends up"
The disease is transmitted similarly to dengue fever. 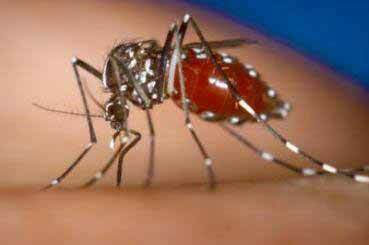 It is transmitted to humans by virus-carrying Aedes mosquitoes. Specifically, there are two species of mosquitoes, A. albopictus and A. aegypti, that are extrinsic hosts (vectors) of chikungunya virus. The strain of chikungunya spreading to the US from the Caribbean is most easily spread by A. aegypti. There is concern that this strain of chikungunya could mutate to make the A. albopictus vector more efficient. If this mutation were to occur, chikungunya would be more of a public health concern to the US. 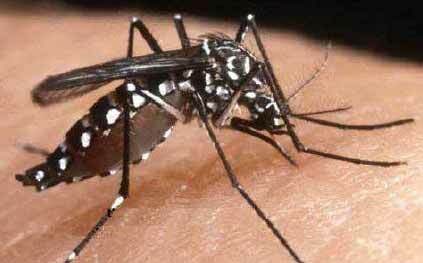 The A. albopictus or "Asian Tiger" mosquito is more widespread in the US and is more aggressive than the A. aegypti. It is known that monkeys, apes, and rodents act as a reservoir for the virus. Having rodents as a viral reservoir for chikungunya differs from that of dengue which has only humans and nonhuman primates as hosts. Signs and symptoms The incubation period of chikungunya disease ranges from one to twelve days, typically two to three. The majority of those infected will develop symptoms. Symptoms include a fever up to 40 °C (104 °F), a petechial or maculopapular rash of the trunk and occasionally the limbs, and arthralgia or arthritis affecting multiple joints. Other nonspecific symptoms can include headache, nausea, vomiting, conjunctivitis, slight photophobia and partial loss of taste. Ocular inflammation from chikungunya may present as iridocyclitis. Retinal lesions may also occur. Pedal edema (swelling of legs) is observed in many people, the cause of which remains obscure as it is not related to any cardiovascular, renal or hepatic abnormalities. Typically, the fever lasts for two days and then ends abruptly. However, other symptoms—namely joint pain, intense headache, insomnia and an extreme degree of prostration—last for a variable period; usually for about five to seven days. People have complained of joint pains for much longer time periods; some as long as two years, depending on their age. Recovery from the disease varies by age. Younger people recover within 5 to 15 days; middle-aged people recover in 1 to 2.5 months. Recovery is longer for the elderly. The severity of the disease as well as its duration is less in younger people and pregnant women. In pregnant women, no untoward effects are noticed after the infection. The most effective means of prevention are protection against contact with the disease-carrying mosquitoes and mosquito control. These include using insect repellents with substances such as DEET (N,N-diethyl-metatoluamide; also known as N,N-diethyl-3-methylbenzamide or NNDB), icaridin (also known as picaridin and KBR3023), PMD (p-menthane-3,8-diol,a substance derived from the lemon eucalyptus tree), or IR3535. Wearing bite-proof long sleeves and trousers also offers protection. In addition, garments can be treated with pyrethroids, a class Asian Tiger Mosquito - Attacking of insecticides that often has repellent properties. Vaporized pyrethroids (for example in mosquito coils) are also insect repellents. Securing screens on windows and doors will help to keep mosquitoes out of the house. In the case of the dayactive Aedes aegypti and Aedes albopictus, however, this will have only a limited effect, since many contacts between the mosquitoes and humans occur outside. Currently there is no specific treatment. Attempts to relieve the symptoms include the use of NSAIDs such as naproxen, paracetamol (acetaminophen) and fluids. Aspirin is not recommended. A mosquito-borne virus that can cause debilitating joint pain lasting for years has spread to the continental U.S. after infecting hundreds of thousands of people in the Caribbean and Central America. The virus is called Chikungunya, an African name meaning “to become contorted.” While the illness, first identified in Tanzania in 1952, has long bedeviled Africa and Asia, the only recorded cases in the U.S. before July involved patients who contracted the virus abroad. Now, 11 cases have been confirmed as originating in Florida, spurring concern this may be the beginning of the type of explosive growth seen elsewhere from a disease that has no vaccine or cure. Medical and environmental experts are debating how best to quell the outbreak before it takes off. “In a way it’s surprising it hasn’t been here yet,” said Scott Weaver, a professor at the University of Texas Medical Branch at Galveston. Patients who contract Chikungunya have joint swelling and pain, fever, headache and rash for about a week, though some symptoms last months or years in some patients, according to the U.S. Centers for Disease Control and Prevention. While the disease generally isn’t fatal, more than 100 people have died in the Western Hemisphere since December, according to the Pan American Health Organization. Treatment includes hydration, rest and medicine that reduces fever or pain such ibuprofen or acetaminophen. Now that Chikungunya is in Florida, it could infect 10,000 people in that state alone, according to Walter Tabachnick, the director of the Florida Medical Entymology Laboratory, who said his estimate is based on the exponential growth of other outbreaks. More than 700,000 people, for instance, are suspected of being infected with the virus in South America, Central America and the Caribbean since it appeared there, according to the Pan American Health Organization. An outbreak of several thousand people in Florida could swamp existing medical facilities, putting at risk the state’s large elderly population, according to Tabachnick. Fish said officials didn’t have the proper kind of insecticide or enough bed-nets to contain the spread of Chikungunya. The disease peaked on the island toward the middle of the year, waning after enough people who contracted the illness built up immunity, he said. In Florida similar efforts to stop Chikungunya early on have faltered. Mosquito control efforts have been “particularly unsuccessful,” Tabachnick said. His laboratory has worked to convince people to remove standing water containers from their yards, such as buckets or clogged gutters, where Chikungunya-carrying mosquitoes lay eggs. The Florida Department of Health and the CDC have issued warnings on the illness and urged people to avoid mosquito bites if they become infected with Chikungunya, since that can infect the mosquitoes, and in turn spread the disease to more people. Tabachnick and Fish also expressed concerns about these efforts. In response to questions about its collaborative efforts to control Chikungunya, health department spokeswoman Sheri Hutchinson said the department has a long history of working with the mosquito control agencies. “As a member of Florida’s Mosquito Control Council, the department collaborates with Florida mosquito control district leaders to monitor and address arbovirus concerns,” she said in an e-mail. The Ministry of Health is hosting a Press Briefing on Chikungunya and Ebola on Tuesday, October 7th, 2014 at 10:00 a.m. The update will take place at the Central Health Region in Belize City. The release does not say if Chikungunya or Ebola are present in Belize. Chikungunya has been detected in other Central American Countries. 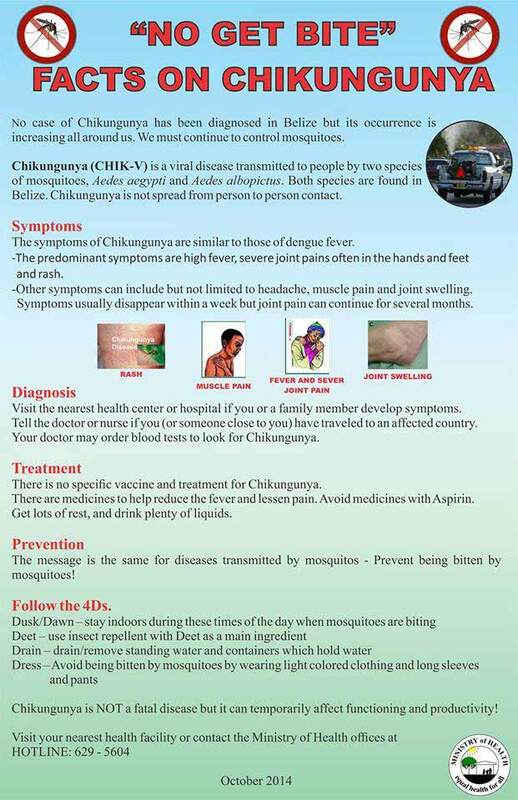 Ministry of Health Fact Sheet on Chikungunya CHIKV! 1. Chick-V is a virus that is known to cause fever and severe joint pain and/or joint swelling, among other symptoms. It was first described in Tanzania, East Africa, in 1952. Its name means 'that which bends up' or 'stooped walk' because of the incapacitating joint pain caused by the disease. 2. It is transmitted from human to human by bites of infected mosquitoes; therefore, measures to eliminate mosquito breeding grounds, to kill mosquitoes and to prevent mosquito bites are important in disease prevention. 3. Most infected persons present with symptoms of the disease after an incubation period of three to seven days, though this period can range from one to 12 days. Some individuals infected with chik-V (3 to 28 per cent) show no symptoms of the virus. 4. In acute (short term) chik-V infection, there may be an abrupt onset of high fever (usually >102F / 39C) and severe joint pain and/or swelling. The fever usually lasts three to seven days. The hands, wrists and ankles are most commonly affected. 5. 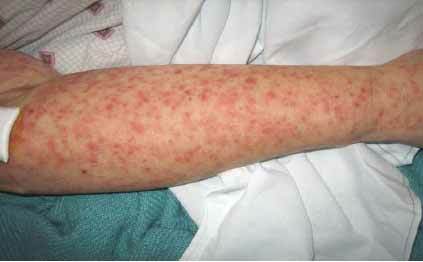 Skin signs include spots or spots and bumps resembling measles in about 50 per cent of patients. The rash mainly occurs on the trunk, arms, thighs and legs, but can affect the face, palms and soles. There maybe generalised skin redness, and blisters (fluid-filled bumps) maybe present in children. 6. Other signs include headache, back pain, muscle pain, nausea, vomiting and conjunctivitis. Atypical clinical manifestations can occur, involving the nervous system, eye, heart, kidney and other organs. Infants, the elderly, pregnancy, diabetes, heart disease and blood-vessel disease can increase the risk of a more severe course of chik-V.
7. After the acute phase, some patients may relapse with joint pain and joint swelling two to three months after. Depression, weakness, tiredness and other symptoms may also occur at this time. Less commonly, some patients may experience chronic chik-V where the joint pain can last over a year. 8. Laboratory tests may help diagnose and assess chik-V and exclude other diseases that may mimic it. There is no specific anti-viral treatment for chik-V infection. Treatment is targeted to the symptoms. Treatment includes fluids, rest, painkillers and anti-fever medication. Most persons recover without needing hospital admission. 9. Depending on clinical manifestations, patients may be sent home or referred to hospital. Patients with chronic form of the disease may need intensive pain management, physiotherapy, and psychological support. 10. Health-care providers should report all suspected and confirmed cases of chik-V to their parish health department. As anticipated and now confirmed through our regional reference laboratory, the Ministry of Health has received confirmation of a positive laboratory result for Chikungunya from the Caribbean Public Health Agency (CARPHA) in Trinidad during the 19th November holiday. This is the first confirmed case in Belize.